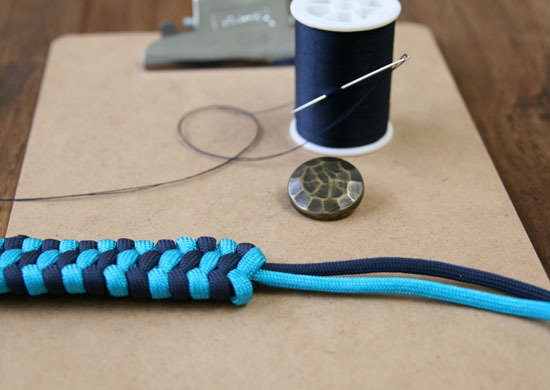 I’ve been looking into more and different kinds of knotting for bracelets lately, and I found this pattern that works nicely for a cool cuff bracelet. I used paracord (utility cord originally used for parachutes, now widely used for other applications) and a brass button for closure. 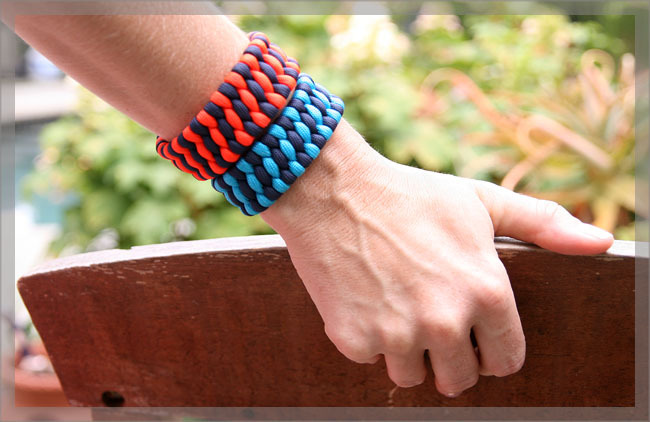 The paracord is relatively thick, which makes this bracelet more of a cuff. 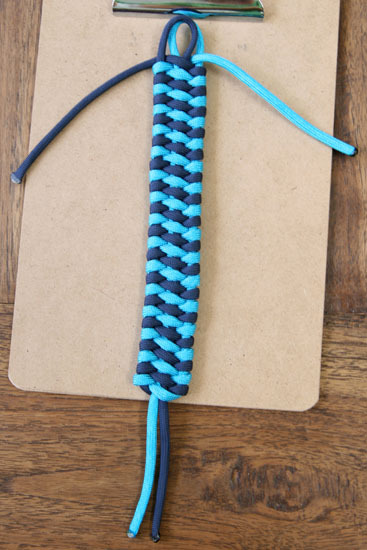 I found a video tutorial for this pattern on YouTube from a guy who calls himself “Tying It All Together.” Those of us who watch him know him as TIAT, too. If you want to see a nice video tutorial for this pattern, you can check his out here. I simplified the steps a bit, and his doesn’t include the finishing of the bracelet. Oh, and he doesn’t talk in his videos, but they are very easy to follow. He goes slowly. 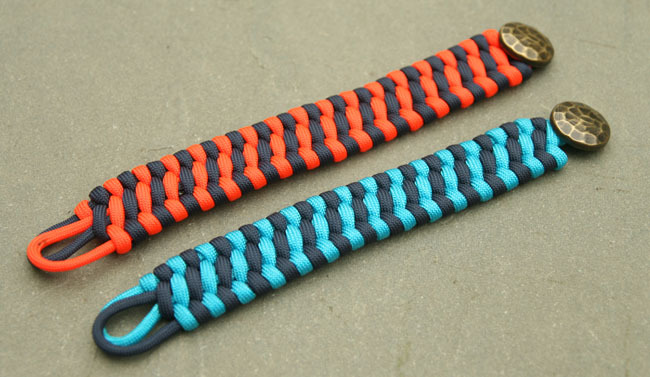 two 5 1/2′ lengths of paracord (550), in whatever colors you choose. I ordered mine from Etsy seller HomerPelican. To start, you’ll need to cut your cord to the right size. 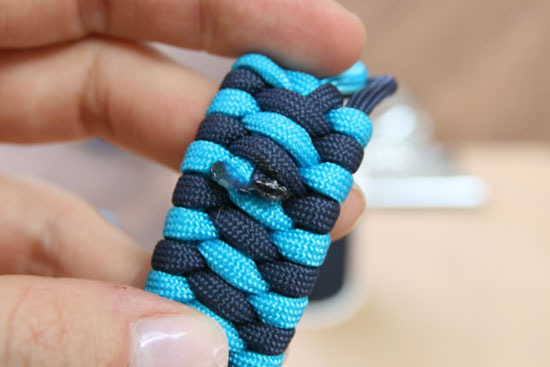 Paracord is a little finicky since it will fray and separate if you don’t seal it. So, once you’ve cut your 5 1/2 feet, you’ll want to burn it to melt the fibers together. 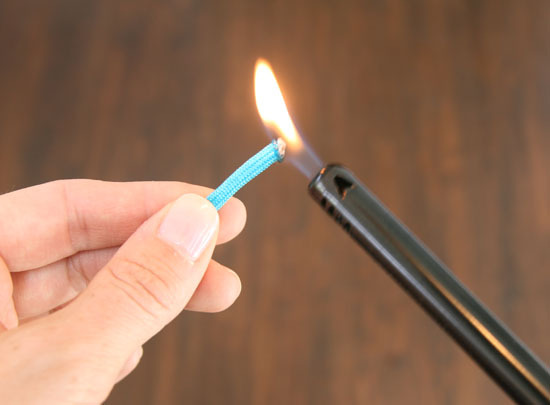 You’ll need to hold the flame on it for about 10 – 15 seconds, until both the inner and outer fibers melt a little. 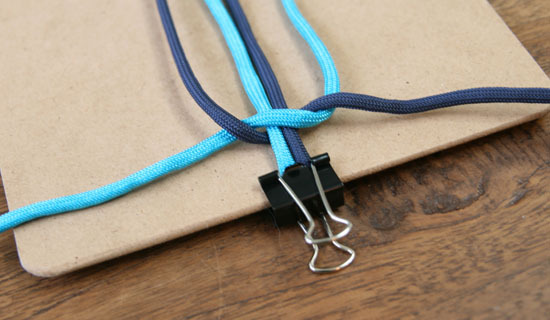 To set up the bracelet, you will put the two cords together and fold them over, with a short end and a long end. The short end should be about 2″ longer than you want the finished bracelet to be (so if your bracelet will measure 7″, make the short end 9″). 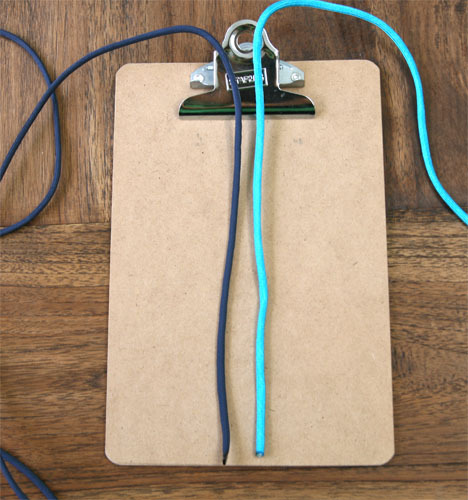 Then, you’ll stack the cords on top of each other and attach them to a clipboard (or you can use tape and attach it to a table). To start, you will take the long cord on the right and lay it over the middle cords, perpendicular to them. Then, you will lay the long left hand cord over the right hand cord. Easy peasy. Now, bring the long left hand cord under the middle cords and over the long right hand cord. This is the foundation for the bracelet. To make things clearer, from here on out I will refer to the far left cord, the one that you will be moving, as the “left working cord,” and the far right one as the “right working cord.” I will refer to the left cord (above, the navy cord) as simply the “left cord” and the right one as “right cord” (above, the neon teal cord). The two center cords are the “middle” or “center” cords. Hope that makes sense. 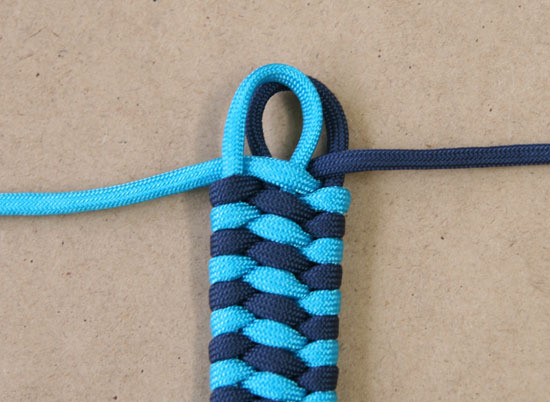 Now, you want to move the very simple knot you’ve made above down the two middle cords a bit. 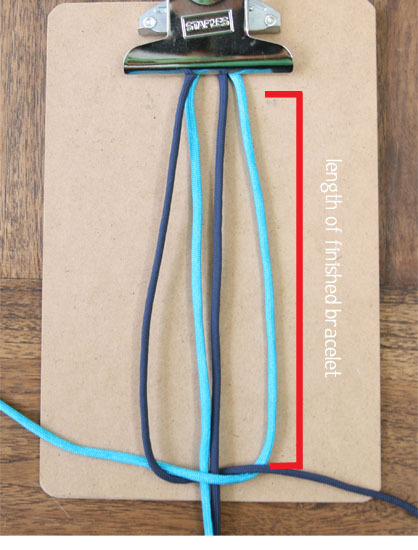 You want the distance from the top of the cords (the bend that you’ve attached to something) to the knot itself to be the length of your finished bracelet. As a final bit of set-up, you’ll want to secure your middle cords down so they don’t flop around. This allows you to keep tension and not worry about so many cords. 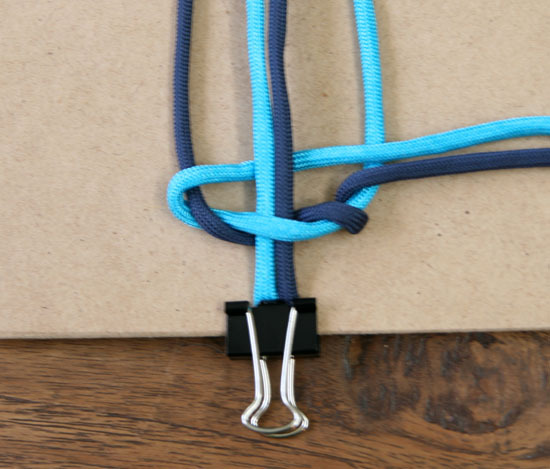 I’ve done it with a binder clip, but you can also use tape. Okee doke? Now it’s time to weave! 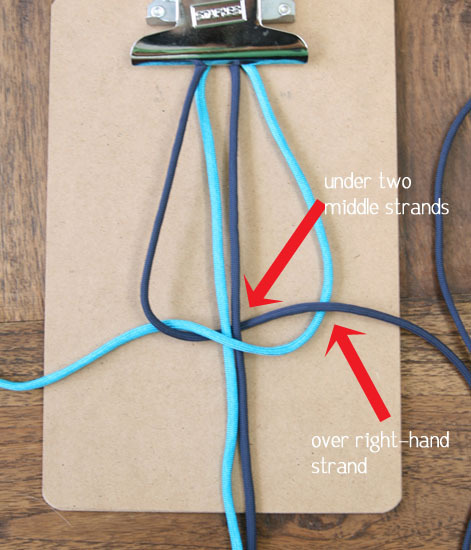 First, take the right working cord and wrap it around the right cord. 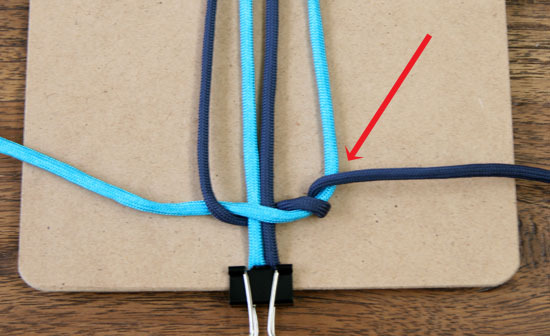 Now, take the left working cord and lay it over the left cord, under the middle cords, and over the right cord, placing it above the wrap you did in the last step. Now pull the left working cord tight. 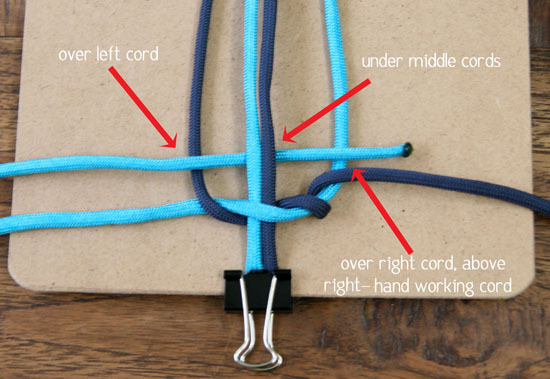 Take the right working cord and put it over the middle cords and under the left cord, above the left working cord. Now, tighten both working cords. As you go, tighten up both horizontally and vertically. Keep weaving until you have a loop at the top that will fit your button. Now you are going to tuck the tails from the top into the back of the bracelet’s weave. First, flip the bracelet over. Do the same with the right hand cord. Time to attach your button. For this you will need thread, a needle, and your button. 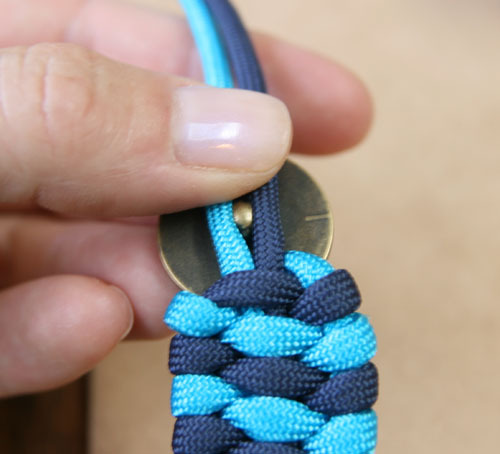 Place the button’s shank in between the two cords, with the face of the button on the front side of the bracelet. Now you will sew the button on by threading the needle through both the cords and the hole in the shank, back and forth. Once you’ve got some good stitches through the shank, you should sew the cords together both below the shank and above it. 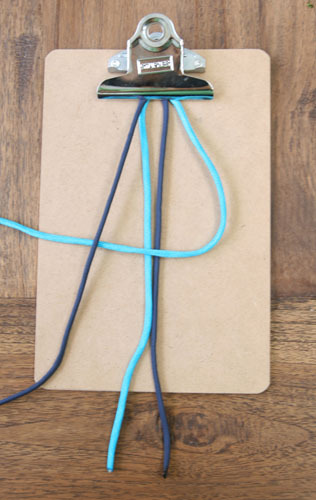 To finish it off, cut the cords underneath the button and melt them to seal. While they are still hot, you can use pliers to squeeze the ends to make them flat, so they lay a little better under the button. 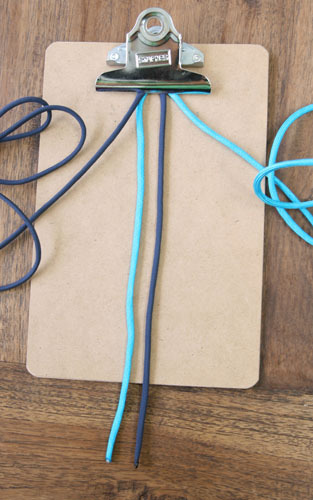 Now you’ll want to cut the top cords as well, and melt them. Be careful not to melt the bracelet itself; it helps if you bend the bracelet so that the cord ends are pointing upwards and are not flush on the bracelet. You can tuck these little melted ends inside the next woven cord; it’s easier to do if you smoosh them with the pliers while they are hot. Done! I think they are pretty cute. Let me know if you make any! Happy day! Love love love LOVE this and can’t wait to try! These are SO cool! Gonna have to try this soon. Thanks for the great tut! That is such a good idea! Its easy to make while looking classy at the same time. US Army Infantry here. We aren’t authorized to have multicolor 550 (Survival Cord) bracelets like this so I just made myself a nice straight tan and figured out how to do it with a button that has holes thanks for the instructions!!! Thanks Chad! So glad you liked it. Thanks for serving our country! That’s a really nice looking bracelet, I’ll have to try it someday! Beth, THANK YOU for posting still pictures of this method. I realize that the chic thing to do on the internet is post videos anymore….but I know for some people it’s easier to learn stuff like this with stills instead of trying to rewind a video a thousand times until you actually see what they’re doing. BRAVO! You are so welcome, John! I totally agree… unless the video is high production quality, it’s often really hard to see what they are doing! And many of them don’t have audio, either. The one YouTuber I love for knotting is JD from Tying It All Together. 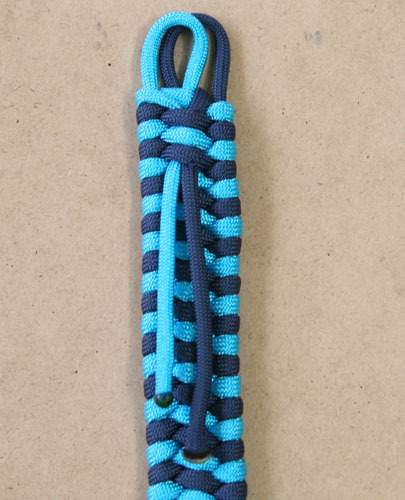 I actually learned this knot from him, so I like to give him a shout out. He has a bazillion different knot tutorials on his channel, and they are good quality. Check him out if you are interested: http://www.youtube.com/user/TyingItAllTogether. 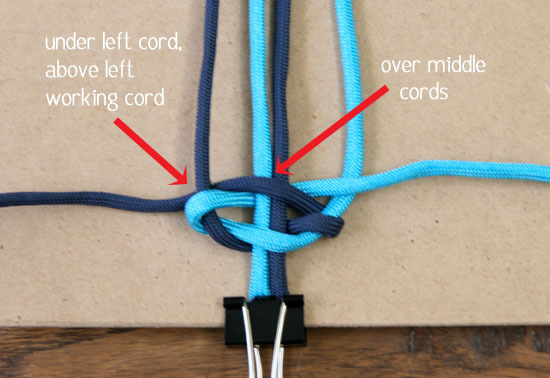 Excellent tutorial, I search the web all last week to find this knot without the use of buckles (they will break eventually, knots don’t). I really like your use of a clip board and binder clips also, keep it simple. 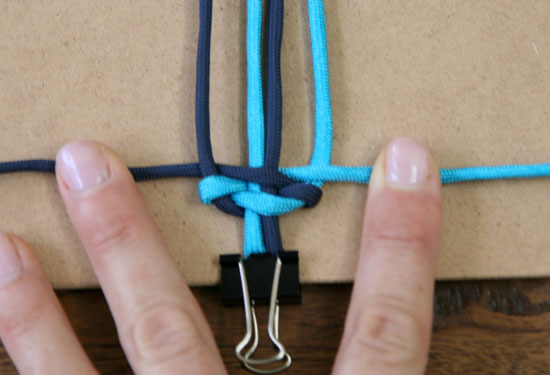 You might consider learning the Diamond knot, after you tie it a couple of times, it’s easy. Thanks and Kind Regards. 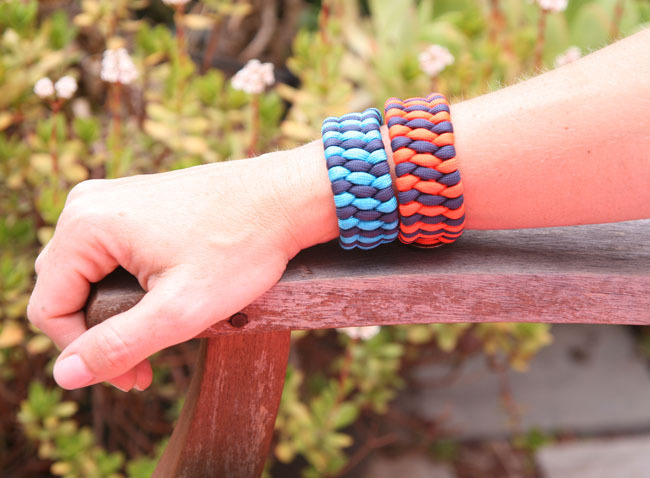 How much 325 paracord should you use for a bracelet pattern that calls for 55 paracord? I would use the same amount. 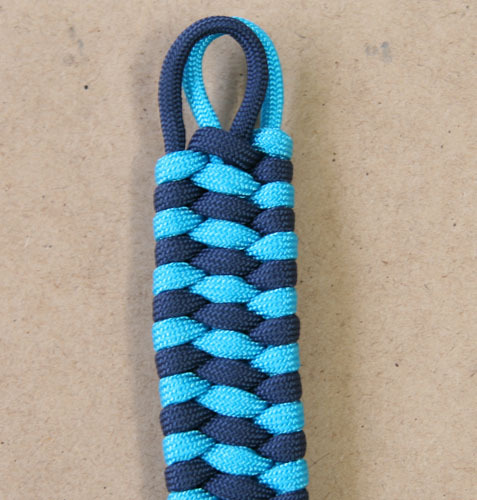 The # of the paracord only refers to its thickness, I think, so you’ll still need the same amount of length. Thanks for your tutorial [stills], this DIY I can’t wait to try! This is beautiful. Btw, do you know how to braid this one? Thanks in advance. How do i figure out how much braiding cord i need? If you look at the supplies list, I used 5 1/2′ of each color of paracord. Nice finishing touch! I made my dog a collar using this pattern (from TIAT), but I used a plastic buckle for the ends. Stormdrane also has some neat patterns and projects to check, just google him. 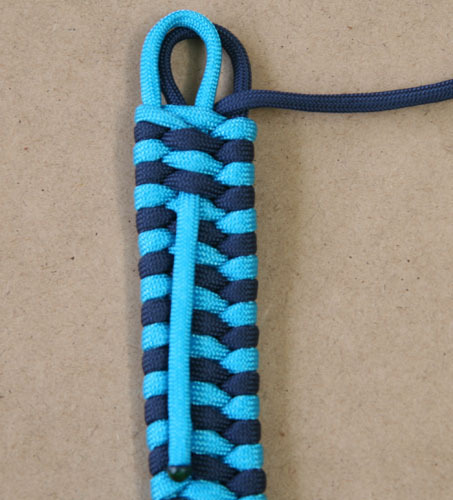 Hi, I want to make a sling for my rifle and I was wondering what lengths of cord I would need to do that? You used 5.5 feet for a 7 ish inch bracelet, so thats 66 inches of cord for 7 inches of bracelt so that about a 9.5:1 inch ratio. so if I was making a 48 inch sling I would need 456 in or 38 feet of cord? Does that sound about right do you think? So glad you liked it! It sounds like you made a fantastic project. I know this is an old post, but I didn’t see the answer already posted, so taking a chance. 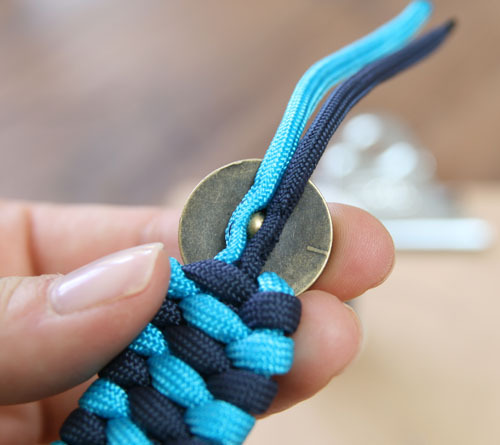 Does this bracelet unravel so you can use the cord? 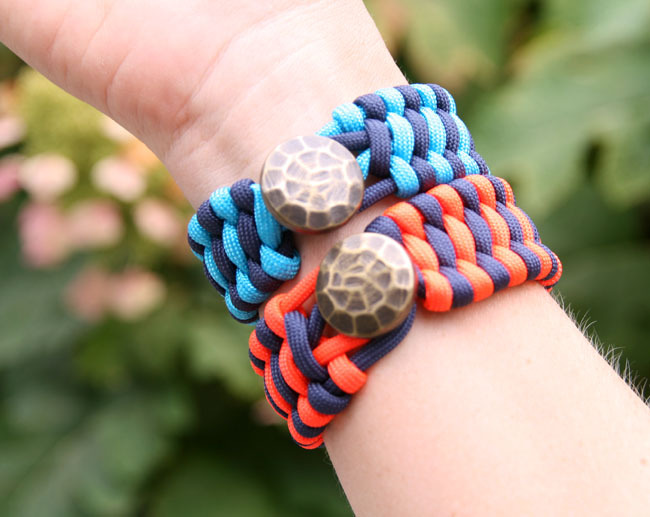 Is is a pretty survival bracelet or a pretty bracelet? It isn’t meant to unravel, and the cord I used is quite thin. That said, you could always dismantle it– the cords aren’t broken in any places. So, not designed as a survival bracelet, but in a pinch might be used as one?